All of the information on this website is based on the Essential Driver Training (EDT) system set down by the RSA. 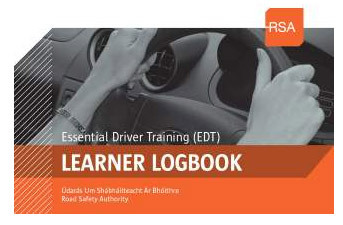 Essential Driver Training which is known as EDT was set up by the RSA to help with road safety in Ireland. The belief is that when a learner is taught to drive correctly within a structured system they gain more information and retain good driving behaviour. EssentialDriverTraining.ie ( EDT.ie ) was set-up by the man behind the award winning DrivingTestTips.ie website to give you more information and help with the EDT system. We will add EDT video tutorials to this website over the near future (we are in the process of producing the EDT video tutorials), this will give you visual help and tips of what you should learn and like DrivingTestTips the content will be easy to understand. This is great news for you the learner, your sponsor and the ADIs because with the use of this resource you will gain valuable information which will make the learning to drive process easy. Learning to drive is made up of two basic parts "Education" and "Practice". This site is supported by Driving Instructors who are marked as Sponsors and wish to help you learn to drive. If you need the help of an ADI please contact one of our Sponsors. 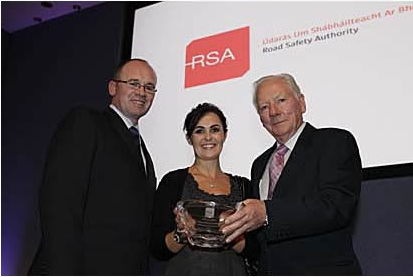 To the right; Brian Conlan with his wife Noirin recieving his award for the work on the DrivingTestTips.ie website. Brian is now developing the new EDT.ie website to bring his experience to you at the beginning to drive stage (EDT). Brians idea for this website will help learner driviers and driving instructors, it will make the EDT stage of learning to drive very easy and will save you money. Start in the right place! From 1st February 2013, no driving test applicant will receive a test appointment without their ADI having first registered and recorded their EDT lessons via the EDT portal.